1) How did you come up with this costume idea? I really enjoyed making these two costumes from things I had laying around the house. I am currently a full time student so funds were a bit low. Everyone says we remind them of "Barbie & Ken" So I improvised off of that, and decided to go with something similar. 2) What items did you use to make this costume? And how? Let's start with Prince Charming. The Shirt was from an old button- up. I had buttons I put over his original buttons, and took some fabric I cut out to make the straight lines going across his top. I then made a collar and cuff links out of more fabric and some more buttons. I took an old necklace to make him a pendant. The sash was made from an old scrub top I had gotten ink all over. I placed some more fabric and buttons on that. His pants were an old pair of jogging pants that I placed the fabric down the side to make them match the shirt. With the Cinderella costume I had an old corset I dyed blue, and placed rhinestones and ribbon all over it. I then cut the tutu and placed fabric and rhinestones across the belt part of the tutu. I made the head band out of fabric, along with the necklace. I hot glued a glass slipper pendant onto the fabric for the necklace. I hot glued ribbon onto the gloves, and fish nets to pull the blue color of the costume together. I spray painted a pair of black heels to tan, and placed ribbon and fabric along the border of the shoe and on the heel. 3) What reactions did you get when wearing this costume? The best part of the costume was seeing everyone's reaction to the home-made costumes. I have NEVER gotten so many compliments in a night! When I proceeded to tell people I actually made the costumes they were stunned. 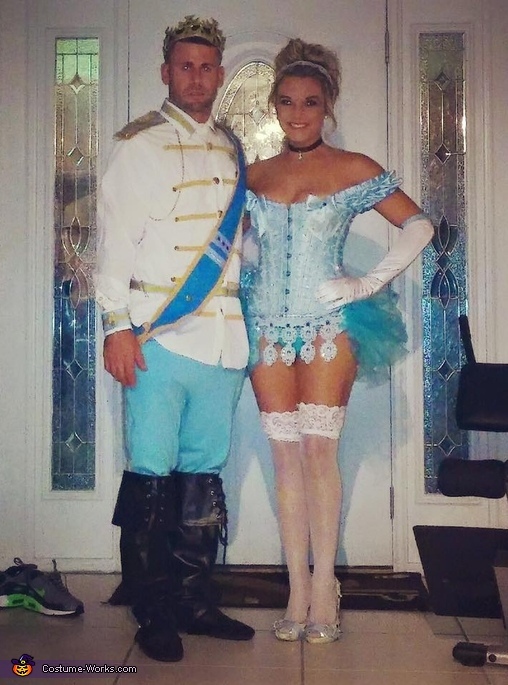 I really enjoyed paying attention to detail on the actual Prince Charming and Cinderella pictures I looked at on the internet.